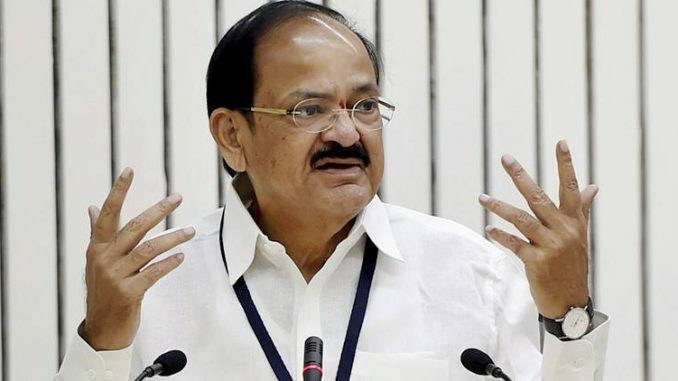 Hyderabad : Union Minister M Venkaiah Naidu on Saturday asked Non-Governmental Organisations (NGOs) to join hands with the government to undertake skill development programmes for youth, to bridge the gap between human resources and talent enhancement. Speaking at a function organised by Swarna Bharat Trust, Hyderabad chapter here, the Minister for Information and Broadcasting also said India aims to skill 402 million people by 2022. Of these, at least 110 million workers are required in over 25 select sectors such as textiles, automobiles, construction, banking and retail. “If China is recognised as the ‘manufacturing factory’ of the world, India can become the human resource capital. Education and Healthcare are the two challenges before the nation. Government cannot do all this alone. It needs the support of NGOs,” Venkaiah Naidu said. “It takes 1-4 years to create an educated/ skilled Indian. Therefore even if a rapid capacity building spree is undertaken, this gap of more than 10 million is very difficult to bridge as the long gestation periods for training make the pace of skilling slower than the pace at which new Indians are entering the working age,” he said. He maintained that in order to tackle issues such as poverty, exclusion and unemployment the Narendra Modi-led government is pro actively doing many things and one such program is Skill Development. The Minister along with Arvind Panagariya Vice-Chairman of the Niti Aayog inaugurated a mega medical camp and distributed Skill Development course completion certificates to trainees of Swarna Bharat Trust. “This number of apprentices is relatively low considering the huge population and demography of India with more than 300 million people in the age group of 18-35 years,” he said.